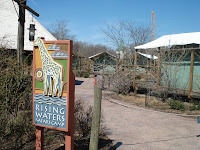 We have a relatively long stretch of time (for us) between trips and already are feeling a little itchy so this weekend, we traveled the 20 minutes to our nearby zoo and spent the mor ning walking around. There's lots going on at our zoo. The pacyderm building is being torn down and the whole area redone. Our elephants are visiting friends at the Columbus zoo from what I hear. Won't they be surprised when they get back! 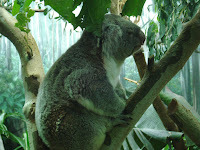 A stop in at the koala exhibit and subsequently the Australian outback area set our hearts pitter-pattering with thoughts of the trip we're planning to Australia in 2010. I remembered our first foray into the "wilds" of Australia with our son who was an exchange student at James Cook in Townsville. We were walking a trail when suddenly Rob stopped and said, "Look up." There nestled in the crook of a tree was a koala, sound asleep (they're usually nocturnal). Rob, expert tracker that he is, saw droppings on the ground and then spotted the gray furry ball in the tree. The koala in the wild wasn't nearly as groomed as the zoo's inhabitants are. We have quite a herd of giraffes now. 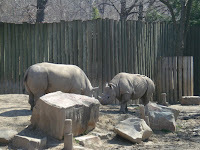 Seeing them in the African Savanna area of th e zoo made me want to check and be sure that a safari was still on my "bucket list." Yup. Still thinking about it. But if we find that it's a little out of our price and or comfort zone, maybe we could take advantage of the camping program the zoo offers. I just want to know if I'll be downwind or upwind from the smells. We didn't make it to the primate building. It's on the top of a huge hill you can walk or ride up by tram. Those exhibits are mostly indoors and we were too excited to be out in warm sunny weather. 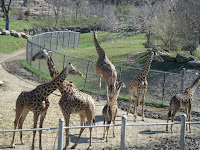 Still, the Cleveland Metroparks Zoo holds a warm spot in my heart. It's been around a long time and I've been going there since I was three years old. Yes, that was a long time ago. But as much as I love a good visit to the zoo, there is someone else who is even crazier--Marla Taviano. She has a website set up called 52 Zoos in 52 Weeks. Check it out. Maybe you'll find a zoo near you that's literally in your backyard. zoos are a favorite around here. I've never been to the Cleveland Zoo, but it sounds neat.